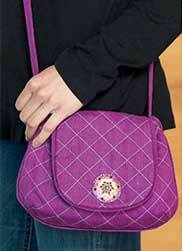 The Mad Money Mini Bag by Indygo Junction is a convenient cross body bag with instructions included for grid quilting! 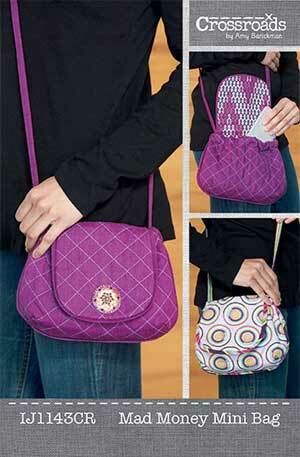 The Mad Money Mini Bag Pattern is an easy to carry crossbody purse that is in a PDF format - just download and start sewing! There is a pocket inside and instructions for flat piping. Instructions are also given for a grid quilting finish and the strap can be made from matching fabric or a pre-made cord. 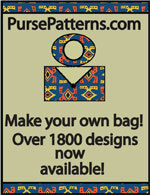 There are two options for finishing and this bag pattern can be made with or without a boxed bottom. Finished size is 6"H x 9.5"W without a boxed bottom and 6"H x 8"W with a boxed bottom. 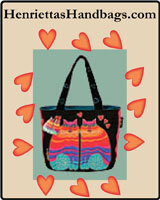 This PDF Bag Pattern has a total of 6 pages. There is a one page cover, 3 pages of instructions, and 2 pages of pattern pieces.